One of my favorite things about doing this podcast is the opportunity to talk about soccer training with other coaches. I want to share one email conversation I had this week. I thought that it was on a topic that a lot of coaches can relate to. I enjoy your coaching podcasts. Relevant topics with good substance. I coach a U14G’s team in Canada. We have 1 game per week, and three team practices per week. None of our team sessions focus solely on fitness. We incorporate fitness in our small sided games/drills (mostly a variation of the rondo). We require our players to work with the ball at home. Many of the travel teams in our age group do a separate team session (a fifth day in the week) focused strictly on fitness. This is without the ball and run by a personal trainer. Many parents ask me why we don’t have a separate session on fitness. My response is at this age I would rather the player’s take that time to work with the ball. What are your thoughts on fitness training for this age group? This week I share a training session I did last week with a couple of my teams. The focus is on controlling the ball out of the air. Our team doesn’t take long goal kicks or have our keeper punt the ball but some of our opponents do so this makes it important to train my players how to get the ball down and under control quickly. This is especially important for younger players now that heading the ball is not an option. Receiving the ball and controlling it to the ground is an important skill for our players to possess. When you see someone shy away from a ball I would say it’s usually because either they haven’t been taught the keys to effectively settling a ball to their feet or they haven’t spent enough time practicing those skills in different environments to become confident in their ability. You don’t just see this in young players. Older players need to spend time on this skill as well so that they’re confident in these situations. Understanding the methods of controlling the ball are important but spending enough time practicing those techniques may be more important. This exercise was described in detail in Episode 44. With older players you should consider starting exercises, patterns or phases of play with balls that are played in the air to help train this ability while also working on other technical and tactical areas. 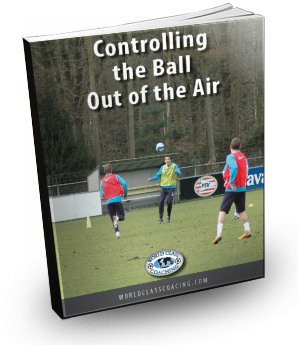 Receiving and controlling balls out of the air is an extremely important skill to possess but I think our players struggle with it at times because we sterilize our practices for them. We rightly spend time focusing on keeping the ball on the ground and playing to feet. Then when there’s a poor pass or a bad bounce in the game they aren’t equipped to deal with it. This is even more noticeable it your team trains on turf but plays some of their games on grass fields. Plan some time to train your players to properly control the ball out of the air with some of these exercises and they’ll be ready when they face a team that always has their goalkeeper punting and their defenders are playing long out of the back. There won’t be a podcast next week. We’ve got a lot of exciting things in the works here at WORLD CLASS COACHING and I’m going to take next week to complete some of those projects. I’ll be back a week from Friday with episode 55!